Israeli soldiers attacked, Wednesday, Palestinian Protesters in various parts of the occupied West Bank, and fired gas bombs, concussion grenades, rubber-coated steel bullets and live rounds, causing dozens of injuries. In Hebron, in the southern part of the West Bank, the soldiers attacked protesters in Halhoul Bridge area, north of the city, and Bab az-Zawiya area in the center of the city, in addition to the towns of Halhoul and Doura. 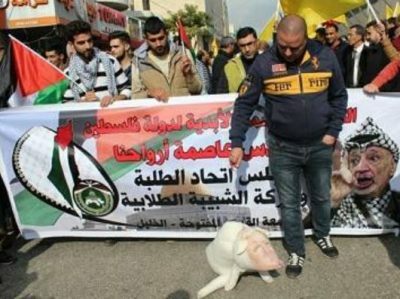 The soldiers injured photojournalist, Abdul-Hafith al-Hashlamoun, with a concussion grenade in his leg, causing a moderate injury. At least four Palestinians were also injured by rubber bullets in the Halhoul Bridge area, north of Hebron, before the soldiers closed it and prevented vehicular traffic in both directions. In the Hebron city, dozens of soldiers attacked Palestinian youngsters in al-Manara and as-Sihha junctions, in addition to King Faisal St., al-Adel St. And Wad at-Tuffah, and forced shut all shops and stores. The soldiers also invaded many homes in Beit Ummar town, north of Hebron, and occupied their rooftops, before using them as firing posts to attack protesters. The Hebron office of the Palestinian Red Crescent said the soldiers injured 27 Palestinians after firing rubber-coated steel bullets and gas bombs at them, in Hebron city, Halhoul Bridge and the al-‘Arroub refugee camp. Seven Palestinians were rushed to a hospital in Hebron city, and two others received treatment by local medics after the soldiers shot them with rubber-coated steel bullets, and at least twelve others suffocated after inhaling gas fired by the soldiers, in addition to one Palestinian who was shot with a gas bomb in his leg. 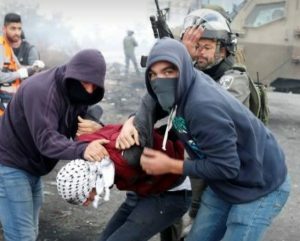 In Bethlehem, the soldiers also attacked the protesters with rubber-coated steel bullets, gas bombs and concussion grenades. Medical sources said the soldiers shot three protesters with rubber-coated steel bullets; one of them is lawyer Farid al-Atrash, the head of the Independent Commission for Human Rights in southern West Bank, in addition to causing many protesters and journalists to suffer the effects of teargas inhalation. The soldiers also shot at least two Palestinians with live fire in Beit Ummar town, north of Hebron, in addition to wounding many others with rubber-coated steel bullets and gas bombs. Furthermore, dozens of extremist Israeli colonists attacked Burin High School for Boys, in Burin, south of Nablus, before the soldiers invaded the area and started firing gas bombs at the students who intercepted the attack, causing many to suffer the effects of teargas inhalation. Israeli sources said one of the colonists was also injured in the head with a stone hurled by one of the students who intercepted the attack. Furthermore, the soldiers attacked dozens of protesters near Palestine Technical University – Kadoorie, in Tulkarem, causing many injuries. It is worth mentioning that undercover Israeli soldiers abducted at least five Palestinians, in the West Bank.